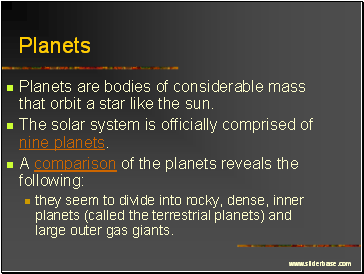 Planets are bodies of considerable mass that orbit a star like the sun. The solar system is officially comprised of nine planets. 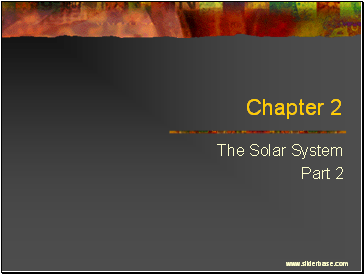 they seem to divide into rocky, dense, inner planets (called the terrestrial planets) and large outer gas giants. The orbits of the planets are ellipses though all except Mercury and Pluto are very nearly circular. The further away from the sun, the slower a planet travels around the sun. Venus rotates very slowly and in the opposite direction of most of the other planets. Uranus and Pluto seem to have been knocked over their axis. 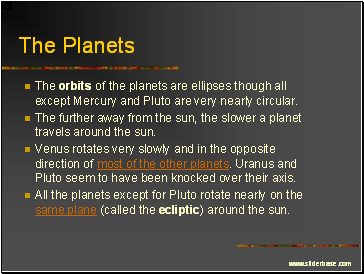 All the planets except for Pluto rotate nearly on the same plane (called the ecliptic) around the sun. 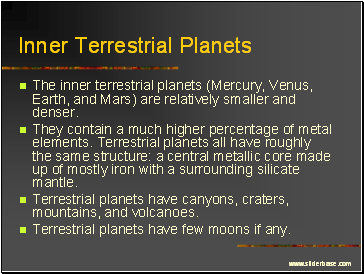 The inner terrestrial planets (Mercury, Venus, Earth, and Mars) are relatively smaller and denser. They contain a much higher percentage of metal elements. Terrestrial planets all have roughly the same structure: a central metallic core made up of mostly iron with a surrounding silicate mantle. Terrestrial planets have canyons, craters, mountains, and volcanoes. Terrestrial planets have few moons if any. Jovian planets (Jupiter, Saturn, Uranus, Neptune) are composed primarily of hydrogen and helium just like the Sun but lack the size to be able to start a fusion reaction. 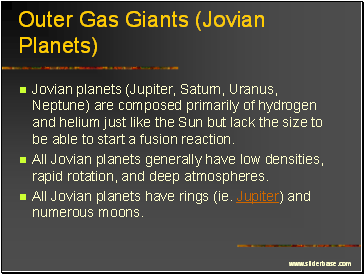 All Jovian planets generally have low densities, rapid rotation, and deep atmospheres. All Jovian planets have rings (ie. Jupiter) and numerous moons. Pluto … is it a Planet? It has a moon, Charon, which is half its size. Very similar to Neptune’s largest moon Triton. Pluto's orbit is highly eccentric. At times it is closer to the Sun than Neptune (as it was from January 1979 thru February 11 1999). Pluto’s orbit is quite inclined compared to the other planets. 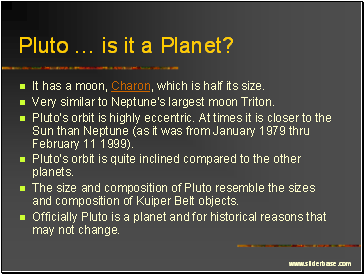 The size and composition of Pluto resemble the sizes and composition of Kuiper Belt objects. Officially Pluto is a planet and for historical reasons that may not change. 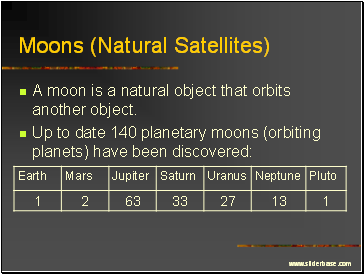 A moon is a natural object that orbits another object.